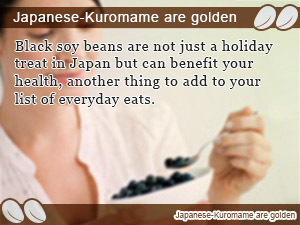 Japanese health food Kuromame black soy beans are good for your body and can give you the extra push you need to maintain weight healthy and succeed in your diet. Black soy beans ("Kuromame") are not only popular in Japan because of the many culinary uses webbed into the Japanese culture so finely that you can get around just by asking about black beans, if fact there are many benefits of black soybeans that are not limited to helping you lose weight. What are the benefits of black soybeans for losing weight healthily? The black bean diet, known as the Kuromame soybean-diet in Japan has been brought to the surface attracting a lot of attention before. While many weight-loss methods come out, black soybean diet is still remains ever popular. Even if you would like to going on the black soybean diet eating Kuromame black soy beans everyday may be too much to ask for. After all, Kuromame traditionally is only eaten during the Japanese New Year celebration period. Does that mean there aren't many people on the black bean diet? Moreover, in a black soybean there are also many people who struggle are without the ability to actually challenge since cooking Kuromame is accompanied by such a troublesome image. Japanese black beans are also used in making Kuromame-cha, a blackish tea made using black soybean giving you're the benefits of black soybeans in every cup. Kuromame-tea can be bought almost anywhere nowadays. 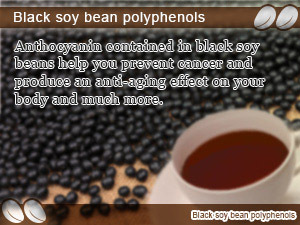 Black soy mean is also contained in many black teas as a health restoring additive. In today's Slism, we will discuss why the Japanese-Kuromame black soybean diet is considered such a highly effective health food and how you can make black soy beans a catalyst for incorporating healthy meals in your diet supporting your weight loss goals. People often associate their image of polyphenols with that of red wine, blueberries, soba noodles, and olive oil that come with amazing health benefits such as antiaging. Kuromame black soybeans contain a polyphenol called anthocyanin that can be found in other foods such as black rice, pears, and potatoes. The following are some health benefits of anthocyanin in your diet. If you are looking for a natural way to improve your metabolism making it harder to put on fat, then incorporating anthocyanin in your diet is a definite must for the full health and cosmetic effect it can give to your diet. Do those who are worried for a while with which raises the risk of cancer by superfluous ingestion also requires it speaking of isoflavone? But since the isoflavone contained in the soybean is a natural ingredient, there are no worries so much. In taking in isoflavone by a supplement, let's be cautious of a volume of intake. The following are some health benefits of isoflavone in your diet. Since estrogen has the work which prevents calcium beginning to melt from a bone, isoflavone with work similar to estrogen is the ingredient which attracts attention from osteoporosis prevention. Moreover, there is work which makes the shape in character with lustrous skin and a woman in estrogen, and isoflavone carries out the support which becomes thin beautifully. Saponin is the astringent taste ingredient contained in the plant root etc. Since it melts into water and oil, it is an ingredient effective for overweight prevention, lifestyle diseases prevention, etc. to remove the lipid of a blood vessel which controls composition and absorption of lipid etc. 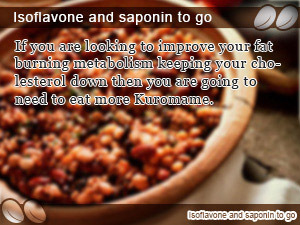 The following are some health benefits of saponin in your diet. The dietary fiber is abundantly contained in the black soybean. When calling it a dietary fiber, there may be some persons who imagine a thing like the fiber contained in the burdock etc., but it is the ingredient which some etc. which melt into water and are been smooth have in a dietary fiber, and is contained in tea etc. A Japanese dietary fiber intake decreases by Westernization of food, and it has become with insufficient. Since it is an ingredient effective also in a diet, let's take in a dietary fiber positively. The following are some health benefits of dietary fiber in your diet. Commercial black soybean tea has many in which difficulty digestive dextrin which is a kind of a dietary fiber is contained. Difficulty digestive dextrin was the ingredient approved as food for specified health use, and it was made in order to compensate the dietary fiber which tends to be insufficient. When the ingredient made in artificial is heard, safety is just going to be worrisome, but difficulty digestive dextrin is made from corn or a potato, and its safety is very high and it can take in it in comfort. There are works which promotes absorption of a mineral, work which prevent accumulation of visceral fat and which works and delays absorption of fat, etc. in difficulty digestive dextrin. Although much tea which contains a black soybean these days is sold, black soybean tea can be made by you, if there is even a black soybean. Recommendation boils, or steams and eats a black soybean at a person weak. Roast 1 cup of black soybeans on a frying pan applying heat steadily. If the skin of a black soybean splits, a black soybean will be moved to a cup. Fill the cup containing roasted black soy bean with approximately 150 mL of water and cover for 5 minutes. It is as good as roasted thoroughly at low heat to eat the black soybean which remained. Moreover, black soybean tea can be enjoyed twice using the same beans. There is more to the soy diet than soy protein. Other sources of health benefits of soy such as lecithin and saponins are out there that you don’t want to miss. Black soy beans are not just a holiday treat in Japan but can benefit your health, another thing to add to your list of everyday eats. Anthocyanin contained in black soy beans help you prevent cancer and produce an anti-aging effect on your body and much more. If you are looking to improve your fat burning metabolism keeping your cholesterol down then you are going to need to eat more Kuromame.